As all good historians know, one of the best ways to discover something amazing is completely by accident. This has happened to me more than once, and a fantastic place to make this kind of discovery is in a library. If we take a broad look at the book, we can see that it is laid out in order to make it easy for a priest to find what he needs, and also to remember it. There are sections with headers that indicate what is to follow, so that the priest can flip through without having to skim to find what he’s looking for. Also, the poem is entirely written in rhyming couplets, so that the priest can more easily memorize the content. In fact, even the major prayers and Articles of Faith are rhymed. For example, the Hail Mary: “Hayl be þow mary fulle of grace / God ys wyþ þe in euery place” (“Hail[ed] be thou, Mary, full of grace / God is with thee in every place”, lines 422-423, translation mine). This rhyming keeps the content, while making it easier for both priests and parishioners to remember the lines. It also demonstrates the growing amount of religious practice occurring in English, not in Latin. This was an important shift that was happening in Myrc’s lifetime. Looking at the words, themselves, we can see that this is meant to be the only book of his own a priest really needs to keep (Myrc even mentions it’s for priests who have no other books in line 2036), as it covers everything from the most important prayers, to witchcraft, to what questions to ask someone who is confessing. Through it, the priest can memorize, or look up, which relatives are too closely related to marry, or what the marriage vows are, or how to decide on the correct penance. What I love about Instructions for Parish Priests, though, is that it also deals with situations that might have been beyond what the priest would have expected to deal with when he was first ordained. For instance, Myrc explains to his reader that midwives should be told to baptize children themselves if a birth is proving difficult (ll.91-96), and to use a knife to remove the baby if the mother dies in the course of childbirth (ll.97-100). This is the type of “real-life” situation in which medieval Christians found themselves worrying about salvation as they tried to figure out the best course of action, and Myrc has it all spelled out for the parish priest. In the event of a difficult birth, everyone will know what to do to ensure the baby (and the mother) will be accepted into heaven. Another interesting bit is when Myrc reassures the reader that the intent to pray correctly is more important than actually remembering the correct Latin words – even for the priest (ll.573-576). This would have been calming to a nervous priest, and also would have been advice that he could pass on to worried parishioners in turn. Myrc had a good sense of what communities needed from their priests, and his book is fascinating in its thoroughness and practicality. This is a book for the trenches of priesthood, which makes it a valuable read for us, today. 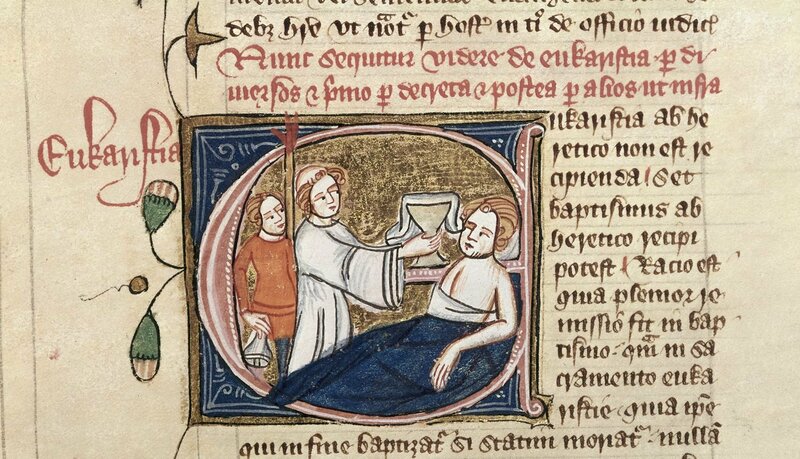 Top Image: Detail of a historiated initial ‘E'(ukaristia) of a priest giving communion to a sick man in bed.